Is there a “third Jesus”? If you have been impressed by seeing Deepak Chopra on TV telling about his new book, The Third Jesus (the Christ we cannot ignore), I suggest you read this post by Ben Witherington. Click here. Postmodern man is unwilling to accept the Jesus of the Bible, but he still needs to believe, and wants to believe. This is what makes all of the cable TV programs about the mysteries of Jesus, the unknown years, and those dealing with the claims of the Gnostic literature so popular. Here are a few Scriptures that might be helpful as you think of Jesus. Peter’s great confession of Jesus took place at Caesarea Philippi. 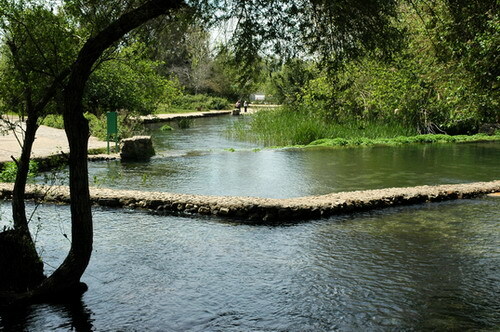 The photo below was made at Caesarea Philippi, one of the major sources of the Jordan River. This was the site of Peter’s great confession. This entry was posted in Bible Study, Culture, New Testament and tagged Deepak Chopra, Gnostic. Bookmark the permalink.